Summer’s over, but here’s one tasty silver lining: lunch break’s back. All around the world, food lovers are seizing these roughly hour-long breaks to destress, hang with their colleagues, and enjoy good food. But what does lunch break look like in Milan and Sydney? What are the most popular dishes in Toronto and Helsinki? The peak hours for a lunch break in Berlin and Amsterdam? foodora took a deep dive into its data to answer all these and more questions. 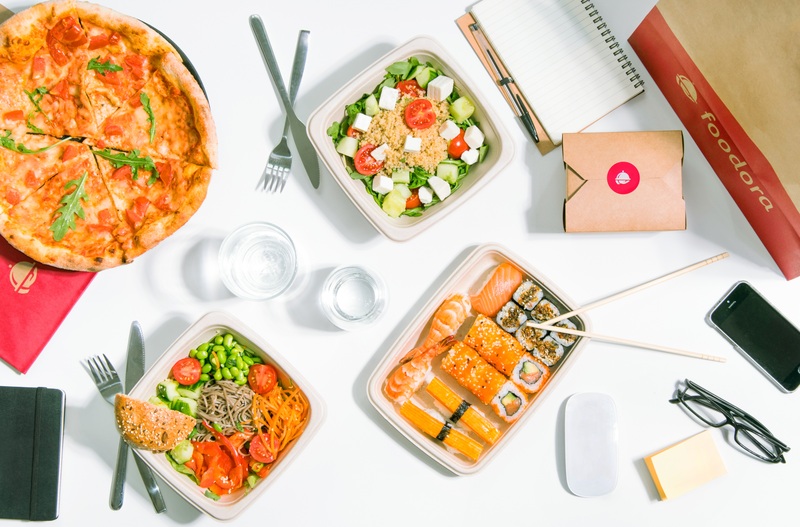 The average lunchtime among foodora’s ten countries emerged as around 12:45, but within that number are three distinct groups: the “early birds”, who eat between 12 and 12:30; those who are “right on time”, eating between 12:30 and 1; and the “late lunchers”, who eat after 1. Canada, Finland and Sweden make up the “early birds”. Germany and Austria, of course, are “right on time”, following a cultural tendency towards timeliness – though they are accompanied by the Australians and French, who have no such reputation. Lastly, the Italians, predictably, lunch after 1, as do the Dutch and Norwegians. In fact, the Norwegians surprised us with their average lunchtime of 3pm, prompting the question: is this even a late lunch? Or is it a pick-me-up to fuel them toward a late dinner? Most food lovers, such as those lunching in Canada, Finland, France, Germany, Italy, the Netherlands and Sweden, buddy up for lunch. But in some places – Austria, Australia, and Norway – the trio is preferred. Eating with multiple colleagues can help create a more open workplace culture, but lunching in twos can also deepen relationships and create lifelong friendships, so we can’t say which should be preferred. Overall what emerges from the data is the incredible diversity of lunch breaks around the world. The Germans tend to favour burgers in several cities, following an explosion of specialty burger joints (which are themselves a response to the fast food restaurants so popular in Germany after the wall fell). But in Munich, Pad Thai is the most-ordered lunch break dish. In Bonn, it’s the burrito. That same picture repeats itself around the world: Banh Mi (a Vietnamese-style sandwich) is popular in Sydney, Halloumi Pita in Helsinki and Tampere, Spicy Salmon Rolls in Vienna and burritos in Turku. Generally, people try to feel good by eating well – whether that means comfort food, as in the above-mentioned burgers and burritos, or healthy food, like salads, which are immensely popular in Amsterdam and Montreal. Another trend was the demonstration of cultural pride through food: in Italy, pizza (in Milan) and panini (in Turin) were the most popular options, and in Utrecht, spicy fish and chips was the most-ordered dish, perhaps owing to The Netherland’s abundance of good fresh fish. In Dusseldorf, Currywurst, a German staple food, took the top spot, and in Stockholm, tacos were number one – and in fact have been adopted as a Swedish food, becoming a staple of Friday night family dinner. In Paris and Lyon, food lovers opted for a French spin on their burgers, ordering them with high-quality cheese like Tomme de Savoie or Fourme d’Ambert. Ordering a 1,5 L ice cream tub is popular in Sydney and The Hague – but that’s no surprise given you can get it from Gelato Messina or Ijssalson Luciano. Sweet potato fries are much more popular in Australia and Germany than anywhere else. As a major superfood, it’s no surprise that Australians, who tend to be health conscious, or Germans, who are known to love potatoes of all kinds, are into them. Germans tend not to order drinks with their meals, as their offices are often stocked with free ones. While a majority of orders include a Cola (light or normal), iced tea is the most ordered drink in Bordeaux. Green tea is trending in The Hague and homemade lemonade is huge in Bremen. Though Italians are often seen as devotees of sparkling water, still water is in fact slightly more ordered. Somewhat unsurprisingly, the sparkling lemonade that Gothenberg is well known for is popular in, well, Gothenberg.